The reawakening of Exquisite Corpse. Robbert Heijnen and Tim Freeman will appear at Body Motion in Peckham’s Rye Wax on Friday. The duo, brought together by tribal/drone polyrhythmic pioneers the Psychick Warriors ov Gaia, will perform live in the 100-capacity basement on August the 12th, with residents Together Dance Music and DJ Ellie warming up and broiling down around them. PWOG will reassemble for the Incubate festival in Tilburg next month, but a UK performance is yet to be suggested – let alone any further Exquisite Corpse gigs. This Body Motion is definitely not one to miss. A few tickets are still available here, and further vibe investigations can be carried out on the FB event here. 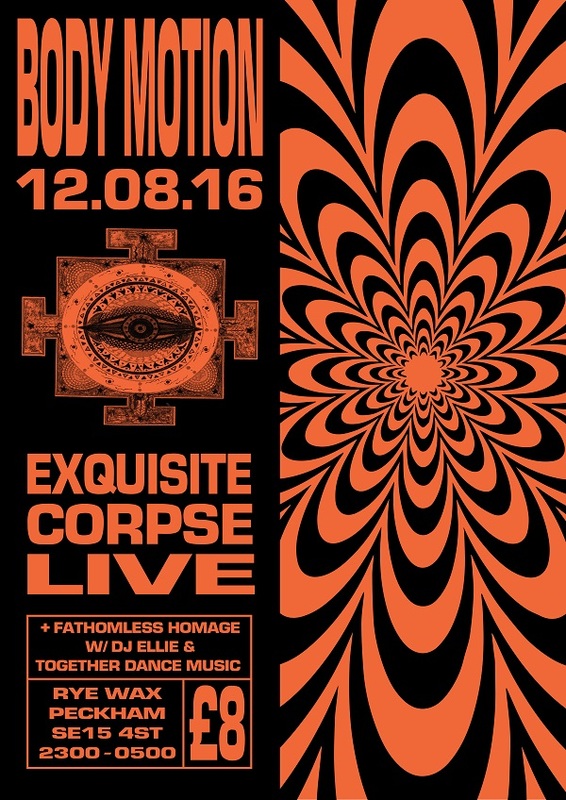 Body Motion will also play a couple of hours down at the Ace Hotel in Shoreditch on Wednesday 10th – expect subconscious ruminations rather than basement booms though.